Whilst there is little doubt that organisational performance relies on a multitude of factors, one of the most prevalent being the characteristics of the organisation’s Chief Executive Officer (CEO). This has been a growing area of interest with an average of 6,000 published studies being conducted in 2009 with this average rising to over 11,000 a year since 2013. As a result of this interest, and a direct request for more information from members, we have compiled a research briefing about the very latest findings about CEO characteristics and their impact on performance. The fact that organisations are significantly more likely to choose people with similar characteristics to those held by the outgoing CEO, unless the outgoing CEO performed poorly. The organisation’s characteristics has a significant influence on CEO recruitment – how well it is doing. Organisations with financial / performance issues are significantly more likely to hire a CEO with an accounting/finance background. CEOs with an engineering/manufacturing background are more likely to be hired by research-oriented firms. CEOs with MBAs tend to be more aggressive and tend to have higher levels of capital expenditures, build more debt, and pay smaller dividends. CEOs with higher degrees, Masters level and above, in management subjects tend to more fixed ideas about how they believe decisions should be made, how strategy should be developed and tend to have a preference for administrative complexity. However, their education level has been found not to be related to the organisation’s performance. CEOs of firms with greater family involvement tend to have more hierarchical management styles and the CEOs tend to feel more accountable to stakeholders, such as employees and banks than they do to shareholders. The CEOs of family owned firms also see their role as maintaining the status quo, rather than bringing about change, unless the organisation is in trouble . Professional CEOs of non-family firms tend to display a more textbook approach of shareholder-value-maximization. tend to develop greater levels of openness to innovation in their organisation. all predict a more entrepreneurial and innovation focused approach. These findings have been backed up in a separate 2018 study15. Additionally, the level of openness to innovation that an organisation has the more ambidextrous (see below) it will be. Furthermore, ambidextrous organisations tend to perform better in changing, volatile and fast moving environments. They tend to be more agile and open to change. CEOs from another national culture (not the home culture) or CEOs who have lived abroad tend to foster both a greater internationalism in their firms and a more international outlook4. This was extended by another 2018 study10 which found that CEOs with foreign experience are significantly more likely to be paid more and obtain higher levels of performance related pay. One interesting, if quirky, 20185 study found that CEOs who use Twitter to share information and knowledge about their organisation and interact with the public tend to have higher trust ratings… as long as the tweets aren’t defensive. Materialism is measured by a CEOs’ relative ownership of luxury goods. The psychology literature defines materialism as “a way of life where an individual displays an attachment to worldly possessions and material needs and desires”. Be less adapt at managing risk (more likely to take risks that expose the organisation, particularly in times of difficulty). Foster more aggressive trading and marketing behaviours. Be more likely to engage in ‘creative’ regulatory interpretations, particularly during a financial crisis, putting the organisation at further risk. Their education, particularly higher-level education such as MBAs. Observation and imitation of similar strategies used by other organisations in their industry, known as the ‘Cluster Effect. Direct social connections, particularly other outside directorships and chair positions they hold. The study found that where the CEOs are involved with successful outside organisations, the influence of those organisations is both positive for their own organisation and the contact with external organisations tends to have a greater positive impact on the CEOs’ strategic thinking – they are much more likely to incorporate strategic learning from the outside organisations they have connections with than from any other source. A 20178 study looking at the senior leadership of 65 firms found that CEOs who are considered to be humble and who genuinely seek feedback about their performance from across the organisation tend to have more effective top management teams and their organisations tend to perform better than organisations with less humble (feedback seeking) CEOs. Further, the study found that humble CEOs with and without a clearly articulated vision are both associated with higher performing management teams and organisations. However, and interestingly, the effect of a humble CEO on organisational performance and senior team performance is stronger with CEOs without a clear vision. This suggests that a CEOs’ articulated vision has a strong impact on the organisation and management team through some form of constraining effect which was not investigated in this study. Another study in 2018 found that overconfident CEOs and CFOs are significantly more likely to engage in tax avoidance behaviours when an organisation is under pressure than more humble CEOs. It is the CEO confidence level that indicates whether illegal tax activities are likely to occur13. CEOs and board members with higher educational background and greater expertise and experiences tend to contribute to higher levels of organisational performance and lower risk for organisations. In particular, how complementary the specialist skills and expertise the CEO and directors have has a significant positive impact on organisational and team performance. It is the mix and range of specialist skills and the educational attainment levels across the top management team that makes the difference11. This study has been backed up by another unrelated, but large scale, study of 16,158 CEOs which found that generalist CEOs have lower levels of performance than specialist ones, if the mix on the board is complementary12. A range of studies have found that CEOs who are better with uncertainty are strongly associated with better levels of both top management team and organisational performance. In particular, a 2018 study found that CEOs who engage in uncertainty avoidance behaviours (denial and avoidance of ambiguous and uncertain situations and the creation of false certainty) tend to promote lower levels of CSR (Corporate Social Responsibility) and performance and have higher levels of narcissistic characteristics14. Having an organisation that can both exploit its current resources, products and systems and, at the same time, innovate to develop new resources, products and systems is key to continued organisational performance, particularly in fast moving and changing technological, political and market environments. An interesting study from 201815 has found that the cognitive capability of the CEO, particularly in their ability to deal with uncertainty (see the finding from above) and their cognitive flexibility (ability to take in peripheral and diverse information and change decision and ways of thinking), is one of the most important factors. CEOs with high levels of cognitive flexibility and an orientation towards uncertainty and complexity were found to create much more ambidextrous organisations. CEO’s are statistically and significantly more likely to choose an organisation to acquire or merge with from a country or region/state where they received education, particularly higher education. There is a significant amount of research looking at CEO psychological characteristics and the impact of these on their organisation. The term dark represents the idea that the combination of these three personality attributes creates a perfect storm of largely malevolent behaviours. People with narcissistic tendencies tend to engage in behaviours ofgrandiosity, entitlement, dominance and superiority. Psychopathy is an antisocial behaviour whereby the individual has low levels of empathy and interest in the well-being of others, combined with high levels of impulsive and thrill-seeking behaviours. People with psychopathic tendencies are frequently considered to be harmful and toxic to others. People who score high in Machiavellianism tend to be amoral, unprincipled and frequently resort to the manipulation of others in order to achieve their own success. It is not hard to see how a combination of these three personality types can be considered to be particularly toxic in an organisational context. A 2017 study17 found that leaders with dark triad traits tend to be aggressive, authoritarian and engage in highly manipulative behaviours with little or no regard for the health or mental health of the organisation’s employees, or indeed their own peers. Such leaders tend to be callous and manipulative, whilst also having a sense of entitlement and superiority. As a result they tend to develop unhealthy relationships with other people and engage in behaviours that are detrimental to their followers’ well-being and career success. Additionally, it was found that the psychopathic and narcissistic tendencies of the leader indirectly predicts approximately 21% of the onset of depression in employees. This has a direct negative impact on employee and organisational performance. Another study20 found that organisations with CEO’s with higher than average levels of narcissistic tendencies are significantly more likely to become embroiled in lawsuits than any other organisation. CEO Agreeableness is a personality trait manifesting itself in individual behavioural characteristics that are perceived as kind, sympathetic, cooperative, warm, and considerate. Conscientiousness – implies a desire to do a task well, and to take obligations to others seriously. These people tend to be more organised and efficient. Extraversion – This refers to a trait whereby an individual obtains gratification outside of themselves. They tend to enjoy human interaction and tend to be enthusiastic, talkative, assertive, and gregarious. However, in changing situations and it has been found18 that conscientiousness and agreeableness are negatively related to strategic change. This means that CEO’s and leaders high in levels of conscientious and agreeableness (see above) tend to do less well in situations that require strategic change. Openness to experience has been found a key trait in such conditions and correlates closely to a CEO’s strategic change capability. Additionally, a level of extraversion and emotional stability are also (but less so) important. Further it has been found that the organisations of CEO’s high in conscientiousness and agreeableness tend to do significantly worse in difficult operating and trading conditions. Whilst extraversion is seen as a largely positive trait for a CEO it does have it’s downsides. It has been shown21 that extravert CEO’s are strongly associated with higher levels of cost of capital (both how much it pays for debt and equity) and higher levels of risk to the organisation. Extravert CEO’s are significantly more likely to engage in more risky ventures than introvert CEO’s. Additionally extravert CEO’s tend to have higher human capital costs and have lower valuations. Bill gates mused in an interview24 that “Microsoft is always two years away from failure”. The need for constant product and systems/business innovation is no longer an issue of competitive advantage for many organisations, but in a world of constant change and volatility, is now simply a matter of survival. It should not be surprising to find that CEO characteristics have an impact on the innovation performance of organisations. Less flexible CEO’s tend to be more risk averse and as a consequence have a negative impact on innovation and organisational innovation outcomes. 2. CEO Openness.The level of openness (see above) an individual has is directly related to their level of risk orientation. People with lower levels of psychological openness as a personality trait are significantly more likely to be risk averse. This in turn reduces both individual innovation behaviours and when that individual is a CEO, the level of openness embedded in the culture and consequently the innovation behaviours experienced across the organisation. High levels of CEO openness = a more mature risk orientation = higher levels of innovation. 3. CEO extraversion.Higher levels of CEO extraversion have been associated with higher levels of organisational innovation. The thinking is that pro-social, high openness, high agreeableness CEO’s are more likely to transmit those traits than more introverted colleagues. 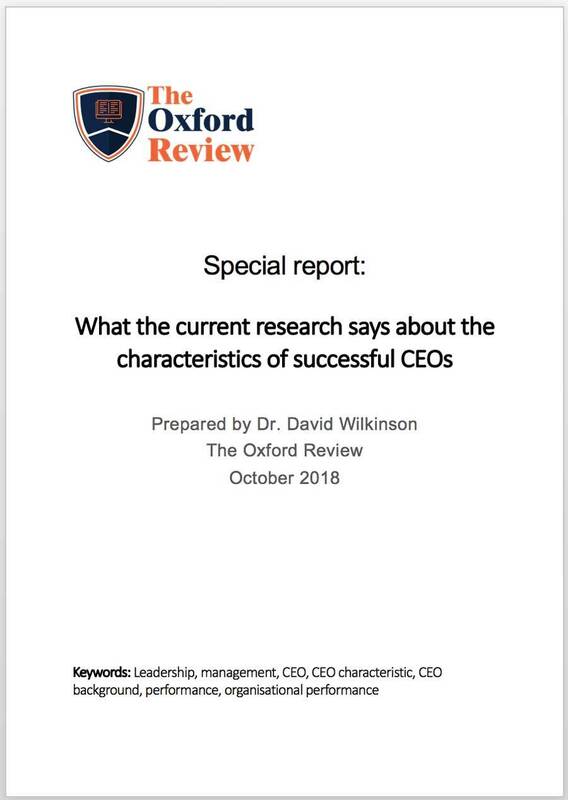 From this overview of the most recent research evidence it is clear that the characteristics, education attainment level and cognitive capability of the CEO, together with their relationship and complementarity with the senior management team has a significant impact on organisational performance. Elsaid, E., Benson, B. W., & Worrell, D. L. (2016). Successor CEO functional and educational backgrounds: influence of predecessor characteristics and performance antecedents. Journal of Applied Business Research, 32(4), 1179. Mullins, W., & Schoar, A. (2016). How do CEOs see their roles? Management philosophies and styles in family and non-family firms. Journal of Financial Economics, 119(1), 24-43. Ahn, J. M., Minshall, T., & Mortara, L. (2018). How do entrepreneurial leaders promote open innovation adoption in small firms?. Vanhaverbeke. W., FF, Roijakkers. N., Muhammad. U.(ed.) Open Innovation in SMEs. World Scientific. Kunisch, S., Menz, M., & Cannella Jr, A. A. (2018). The CEO as a key microfoundation of global strategy: T ask demands, CEO origin, and the CEOs international background. Global Strategy Journal. Huang, L. V., & Yeo, T. E. D. (2018). Tweeting# Leaders: Social media communication and retweetability of fortune 1000 chief executive officers on Twitter. Internet Research, 28(1), 123-142. Bushman, R. M., Davidson, R. H., Dey, A., & Smith, A. (2018). Bank CEO materialism: Risk controls, culture and tail risk. Journal of Accounting and Economics, 65(1), 191-220. Oh, W. Y., & Barker III, V. L. (2018). Not all ties are equal: CEO outside directorships and strategic imitation in R&D investment. Journal of Management, 44(4), 1312-1337. Ashford, S. J., Wellman, N., Sully de Luque, M., De Stobbeleir, K. E., & Wollan, M. (2018). Two roads to effectiveness: CEO feedback seeking, vision articulation, and firm performance. Journal of Organizational Behavior, 39(1), 82-95. Wiersema, M. F., Nishimura, Y., & Suzuki, K. (2018). Executive succession: The importance of social capital in CEO appointments. Strategic Management Journal, 39(5), 1473-1495. Conyon, M., Hass, L. H., Vergauwe, S., & Zhang, Z. (2018). Foreign experience and CEO compensation. Journal of Corporate Finance. Liu, C. L. Skill Specialist or Generalist? Does CEO Substitute or Complement Directors?. Hsieh, T. S., Wang, Z., & Demirkan, S. (2018). Overconfidence and tax avoidance: The role of CEO and CFO interaction. Journal of Accounting and Public Policy, 37(3), 241-253. Kim, B., Lee, S., & Kang, K. H. (2018). The moderating role of CEO narcissism on the relationship between uncertainty avoidance and CSR. Tourism Management, 67, 203-213. Olga, T. (2018). CEO Characteristics and Innovations: an Empirical Study of European Public Companies of Pharmaceutical Industry. Jeong, S. (2018). Two essays on organizational ambidexterity: the role of CEO and analyst cognitions. University of Texas repository. Wang, Y., & Yin, S. (2018). CEO educational background and acquisition targets selection. Journal of Corporate Finance. Tokarev, A., Phillips, A. R., Hughes, D. J., & Irwing, P. (2017). Leader dark traits, workplace bullying, and employee depression: Exploring mediation and the role of the dark core. Journal of abnormal psychology, 126(7), 911. Wang, S., & Chen, X. (2018). Mining Linguistic Clues From Social Network: Impact of CEO Personality on Business Performance. Harrison, J., Thurgood, G. R., & Boivie, S. (2018, July). The Effects of CEO Personality on Strategic Change and Firm Risk. In Academy of Management Proceedings (Vol. 2018, No. 1, p. 10102). Briarcliff Manor, NY 10510: Academy of Management. O’Reilly III, C. A., Doerr, B., & Chatman, J. A. (2018). “See You in Court”: How CEO narcissism increases firms’ vulnerability to lawsuits. The Leadership Quarterly, 29(3), 365-378. Liu, D., Fisher, G., & Chen, G. (2018). CEO attributes and firm performance: A sequential mediation process model. Academy of Management Annals, 12(2), 789-816.